Plans for the next Wells Fargo Center renovation phase have been unveiled, as the main concourse will be overhauled prior to the Philadelphia Flyers‘ and Philadelphia 76ers‘ 2019-20 seasons. This round of upgrades is part of a multi-year, $250 million initiative of upgrades named Transformation 2020. Among the renovations include a re-conceptualized approach to dining and social interaction throughout the arena’s Main Concourse level, 8,000 brand new seats within the lower bowl, a concierge-style box office, and a LED video and lighting system. The culinary scene within the Wells Fargo Center’s Main Concourse level is set for some changes. Drawn from Philadelphia’s list of eateries and gastro-pubs, new and returning establishments include: P.J. Whelihan’s, Lorenzo’s Pizza, Shake Shack, Chickie’s & Pete’s, Federal Donuts, Campo’s, Chick-fil-A and more. Perhaps the most noticeable enhancement will be the expansion and redesign of the Main Concourse level’s central plaza, which will be modified to take on a “bistro meets marketplace” feel. An additional 4,000 square feet of open concourse space and new seating will make way for an expansive social gathering area where guests will find numerous dining options. The new open hall concept, styled after some of Philadelphia’s historic public markets, will feature a broad slate of options. Uniquely Philadelphia and on-trend menu items from a new flex kitchen will have the ability to modify offerings event-to-event in order to provide an ever-changing dining experience. 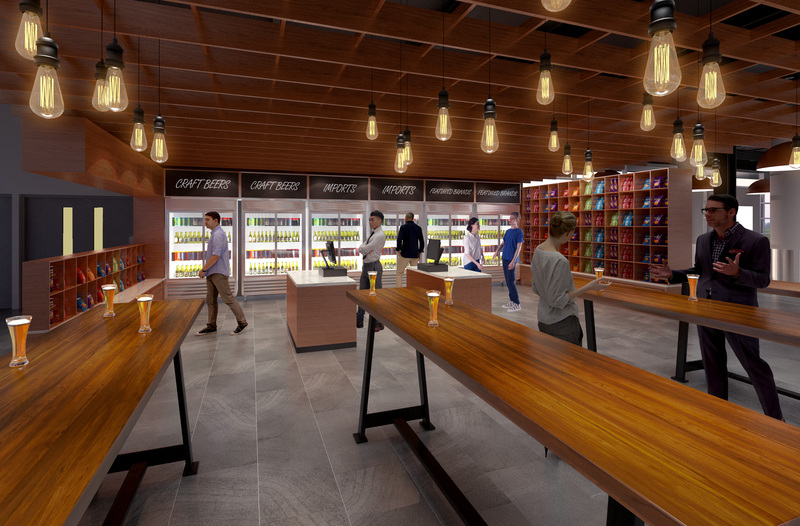 The unique space will also feature a “grab & go” craft beer boutique with an extensive list of local brews in an industrial atmosphere. The makeover will also include a large, redesigned pub-style bar. The Concourse club area, to be situated alongside the arena’s eastern corridor, will also have a completely new look and layout. Centered by a full-service bar with modern, industrial finishes, this space will be designed as a destination for fans to enjoy a drink or a bite to eat. In addition, more than 15,000 square feet of LED video technology throughout the concourses on every level, along with menu boards, game action screens and rotating signage, will be integrated to react instantly to action on the ice or court. All new seating will be installed in the lower bowl, which accounts for 40% of the arena’s total capacity. The lower bowl’s new seats will match the models installed on the Mezzanine Level last summer. The 2019 lower bowl makeover will mark the last of the original “Spectrum Red” seats inside the Wells Fargo Center, as they will depart to finish a unified look throughout the venue. To accommodate the expansive new marketplace, the Box Office will be relocated and completely remodeled to give guests a hotel concierge-style setting as they secure tickets to the their favorite events and request information. The new North End Box Office will be located adjacent to the Broad Street entrance, facing Center City, and will include 10 points of service. This Transformation 2020 announcement follows the Wells Fargo Center’s introduction of plans to install the world’s first Kinetic 4K center-hung scoreboard. Arriving in the Fall of 2019, the system will feature 65% more 4K LED screen real estate when compared to the Wells Fargo Center’s current center-hung model, and is larger than any arena scoreboard that hosts both NHL and NBA games. The Kinetic 4K system also features two crown trusses with independent movement and an ability to expand and contract its main screens in order to best highlight the action below. Last summer, the Wells Fargo Center implemented a total makeover of the arena’s Mezzanine Level, which accommodates approximately 40 percent of the arena’s total capacity. That round of changes included new and expanded food and beverage options, concourse layouts with skyline views, over 150 new LED game-action screens, and upgraded points of sale.